The intermediate Xingyiquan Competition Routine is examined and approved by the Chinese Sports Administration, Chinese Wushu Reach Institute and Chinese Wushu Management Center. It consists of six parts and 48 movements, with rich content and reasonable, various structure changing and great difficulty. 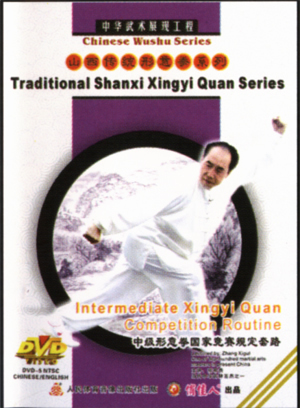 Basically, it contains the hand techniques and footwork as well as leg techniques and jumping and etc of traditional Xingyi Quan, which means that it maintains the main skills from Five Elements, Twelve-style Quan and Advancing and Retreating Continuous Quan, Four-technique Quan and Mixture Styles Quan. It has the continuous, compact characteristic in practicing, and it is a quite comprehensive routine.